Fairmuir secured their second cup triumph in a week following victory over Montrose in the Diamond Jubilee Cup Final held at North End Park, Dundee. A goal in each half proved the difference between the sides in what was a highly entertaining and open contest. Montrose began the match strongly with the direct running of Kai Henderson forcing the first corner of the match. Mitchell Smith's delivery was dealt with by the Fairmuir defence preventing any opportunity for the Montrose forwards lurking in the box. Buoyed by their 5-0 victory over Dryburgh the previous week, Fairmuir began to gain a foothold in the game and saw Josh Hamilton’s effort flash wide of the post. Untroubled by the earlier effort Ross Duncan in the Montrose goal had to look lively to hold Curtis Smyth’s drive from just outside the area. As Fairmuir continued to push for the opener they were halted by the offside flag on two occasions in quick succession. Fairmuir’s attacking play was almost rewarded when Ethan Samson took the ball past Duncan and was only prevented from opening the scoring by a last ditch clearance from Dylan McDonald. Montrose appeared to gain the initiative soon after and won a corner through Jamie Raffen but Keiran Melvin’s delivery was cleared by the Fairmuir defence. As the Montrose midfield pushed forward Fairmuir hit on the counter with Jay Couper controlling a long ball from the back and using his pace advanced beyond the Montrose back-line. Couper then showed great composure to slot the ball into the empty net after his initial effort had rebounded off Duncan. Montrose attempted to restore parity immediately and won a free kick in a dangerous area with Henderson’s effort finishing wide of Jamie Lockhart’s goal. Following his goal, Jay Couper became heavily involved in Fairmuir’s attacking play and delivered a good free kick into the box requiring Duncan to palm the ball to safety. Couper was playing with confidence and again called the Montrose keeper into action with a powerful drive which landed at the feet of Jay Kidd who fired wide. As Fairmuir attempted to utilise the pace of Couper in their search for their second of the afternoon, Duncan had to be alert to collect two through-balls played from midfield. With the half drawing to a close, Montrose fashioned good chances to go into the half on level terms. Kieren Melville’s effort produced an impressive save from Lockhart with Mitchell Smith being unable to keep his effort on target following the rebound. Melville had another attempted shortly after and was prevented from levelling the contest by another sold stop by the Fairmuir number one. Fairmuir created the first opportunity of the second half and almost doubled their advantage through Josh Hamilton’s effort which was well held by Duncan. Montrose continued to press for the equalizer and it almost arrived in spectacular fashion from Mitchell Smith’s looping effort which cannoned back off the upright with the keeper beaten. At this stage of the match the momentum appeared to be with Montrose and Henderson’s free kick sailed just beyond the onrushing Jamie Raffen. As the pressure continued Walker had an effort saved by Lockhart and Henderson struck a powerful free kick against the bar. Fairmuir continued to look dangerous on the counter and some good link-up play between Keir Murray and Curtis Smythe saw the latter fire a shot wide of the post. Montrose were awarded a way back into the match after the referee judged Lockhart handled the ball outside his box. Henderson stepped up to take the free kick positioned in line with the penalty spot and saw both his efforts rebound off the wall. At the other end of the park, James Wilson was released on goal by a good ball from Ethan Samson but saw his shot saved by Duncan with Couper unable to keep his connection to the rebound on target. Henderson continued to play an important role in the attacks from Montrose, sending a free kick onto the head of Matthew Nelson which sailed over the bar and providing a deep cross that almost connected with Keiran Walker at the back post. The game was settled as a contest three minutes from time when Jay Couper collected a ball over the top and knocked it past the keeper for his second of the afternoon. Overall, both sides demonstrated the abilities which got them to the final and provided a contest worthy of such an occasion. Montrose will use this experience as they plan for next season and Fairmuir will celebrate another piece of silverware in what is proving to be a memorable season. Mark McCrory -Marshalled the deference superbly while under severe pressure from Montrose as they pushed for an equalizer. Kai Henderson - Instrumental in the attacking play from Montrose and did not deserve to be on the losing side. 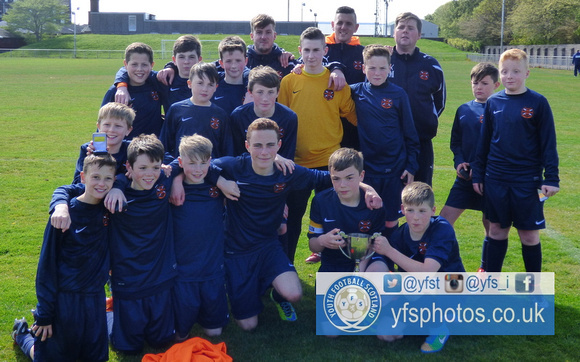 Jay Couper's burst of pace away from the Montrose defence led to the opening goal and ultimately cup-final glory. Mitchell Smith’s spectacular effort which rebounded off the upright and came agonizingly close to levelling the contest.